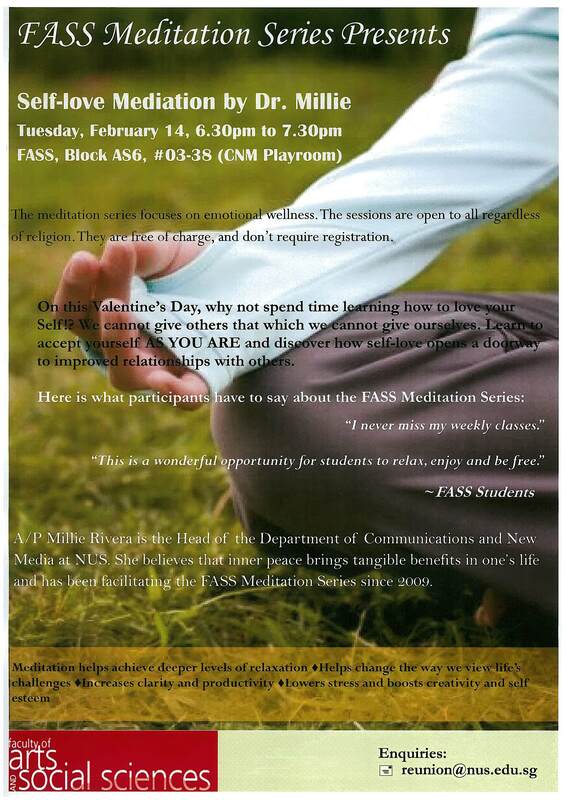 We will try our best to accommodate your schedule and will contact you again just before the CORS system opens. 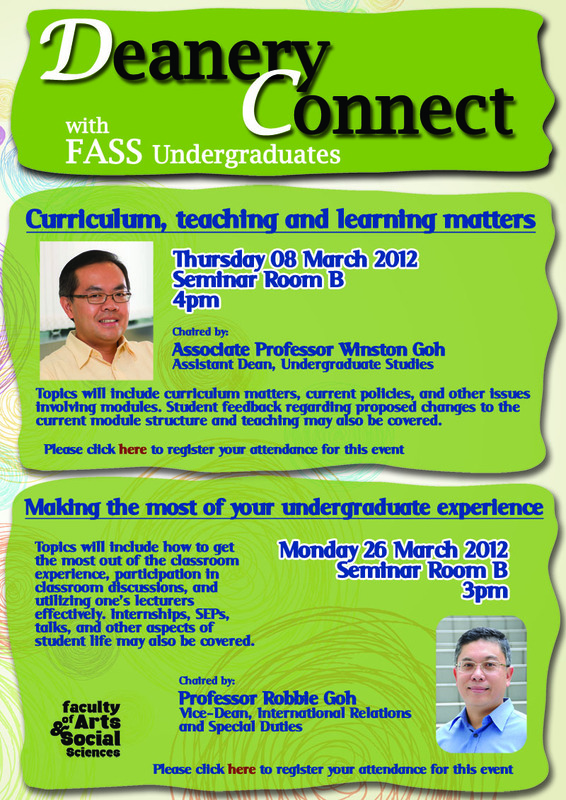 For enquiries, please contact us at careers@nus.edu.sg / 6516 1385. 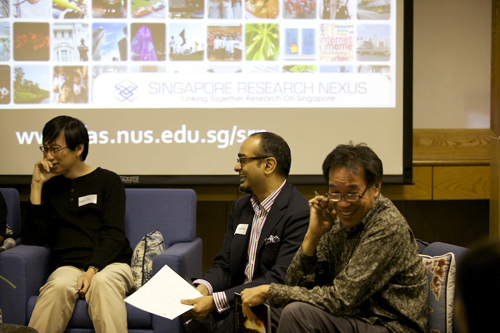 On Friday 17th February the Singapore Research Nexus (SRN) was delighted to host a fascinating symposium titled ‘Creativity in Singapore’. 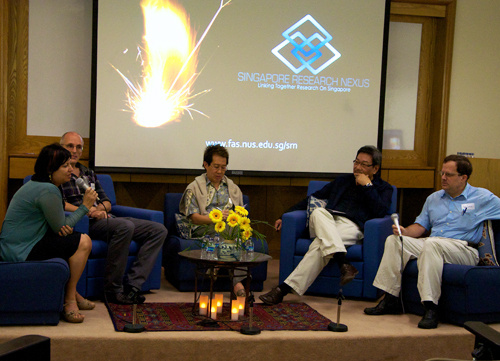 The afternoon provided a unique opportunity for local celebrated writers and researchers to discuss Singapore and how it fares as an environment for creative writers and those researching creativity Singapore. The 40 minute film, directed by the poet and critic Gwee Li Sui features four writers, all FASS alumni, who write in each of Singapore’s four official languages. They are Rasiah Halil, Lee Tzu Pheng, Ting Kheng Siong and Vadi PVSS. Each of the writers shares with Gwee their take on the meaning of literature, poetry and theatre and on how Singapore wrestles with its own historical and social constraints in relation to the literary arts. Following the screening the audience enjoyed a ‘Post-Screening Conversation’, chaired by the playwright Huzir Sulaiman who helped to field questions from the audience about creativity and writing in Singapore. After the afternoon break it was the turn of our own FASS Faculty to present their papers on how our research ‘engages the creative’. First up was A/P Lonce Wyse from the CNM department whose talk on ‘Creativity, Interdisciplinarity, and the New Relevance of the Arts’ showed how it is really a false dichotomy to uniformally separate the two and view each as an equal and distinct means or end. Rather, Prof Wyse showed some intriguing recent examples of how the two can meet to create extraordianry pieces of hybridity. Second to present was A/P Maria Kozhevnikov (Department of Psychology)who shared her findings on the relationship between creativity and visualization. The study showed that ‘object visualization’ relates to artistic creativity, and ‘spatial visualization’ relates to scientific creativity, while both are distinct from verbal creativity. The third speaker was Dr John DiMoia, Assistant Professor in the History Department, who looked at the historical example of Stanford University compared to the case of what Singapore as a country has done and might do to encourage attributes and practices of creativity among the members of its scientific community. Last to present was A/P Ho Kong Chong (Department of Sociology) who looked at the wild and unruly side of the creative economy and how work-styles associated with this form of production are closely tied to particular types of urban environment, for example parts of Little India and Geylang. These ungentrified portions of Singapore enjoy low rents and centrality while offering a vibrant and more liberal and hence ‘creative’ environment. 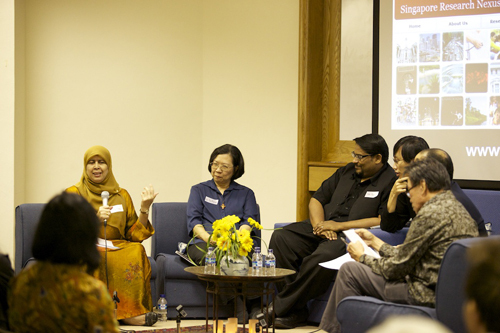 The second session concluded with a vibrant Q&A session leaving many to agree that the symposium offered a diversity of perspectives on Singapore and its evolving relationship with the creative. 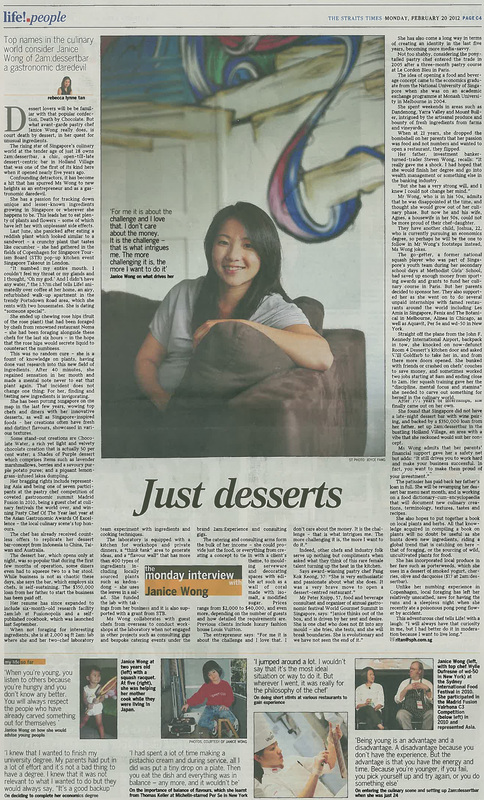 This article features Janice Wong, a former Economics student at FASS and her rise to fame as a renowned pastry chef. 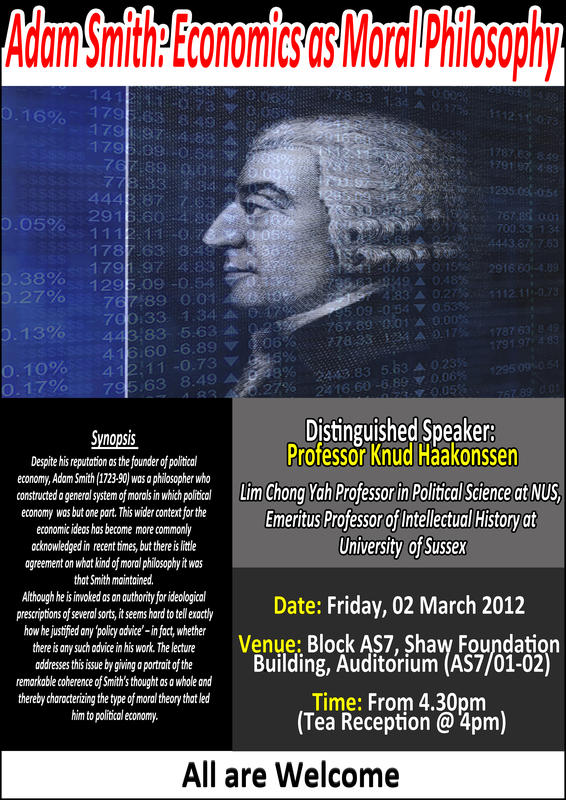 The Department of Political Science presents the Lim Chong Yah Public Lecture “Adam Smith: Economics as Moral Philosophy” conducted by Prof Knud Haakonssen, Emeritus Professor of Intellectual History at the University of Sussex. A map of where our college is located can be found here. Please register HERE, by 22 February. This talk is open to ALL NUS undergraduates, so do share this with your friends. Model NATO Youth Summit is be the largest simulation of the NATO decision-making process in Europe, to be held in Brussels, from the 8th to 13th of July 2012. This first edition’s central theme is the “Political responsibility through leadership, innovation and strategic thinking in the XXIst century”. MoNYS 2012 will bring together 29 delegations, representing 221 participants from both Europe and North America. 21 Individual application from Africa, Asia, Australia and Latin America. This project aims to achieve diversity, continuity and sustainability. MoNYS 2012 will take place in the capital city of the European Union, and benefits from the fruitful cooperation with the NATO Headquarters in Brussels and Université Libre de Bruxelles (ULB). 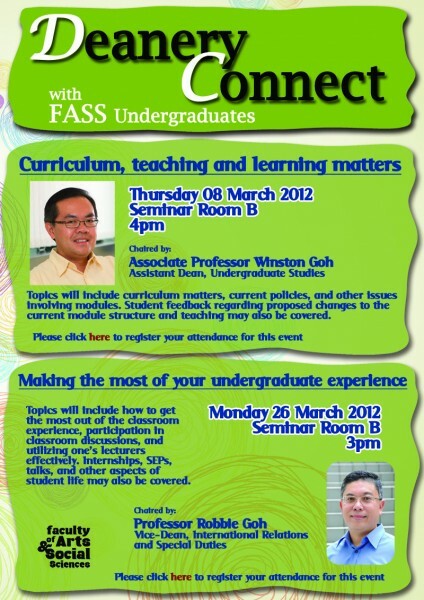 The conference serves as a platform for young delegates with different backgrounds, to share their ideas and network. During this six-day event, students will have the chance to broaden their views on different political approaches, while getting to know each other’s cultures better. MoNYS 2012 addresses the topics of smart defence, military capabilities, emerging security, fight against cyber attacks, missile defence shield and partnership action plan with the Caucasus countries. The ultimate goal is to deepen NATO’s decision-making process, while creating a platform for students to enhance their consensus-reaching skills, alongside mastering the art of negotiation. Together we embark on the path towards a more peaceful and tolerant world, where citizens are in search of humankind’s ultimate goals: world peace, global security, economic prosperity, scientific improvements and worldwide literacy. A recent research project titled “Attentional Focus on What’s Motivationally Relevant Aids Performance at High Exercise Intensities” accomplished by Senior Lecturer Dr. Lim Wee Hun Stephen and student researcher Mr. Loh Kep Kee won, among all international research entries, the prestigious Best Research Paper Award at the Annual International Conference on Cognitive and Behavioral Psychology (CBP 2012) held on 13 and 14 February in Singapore this year. 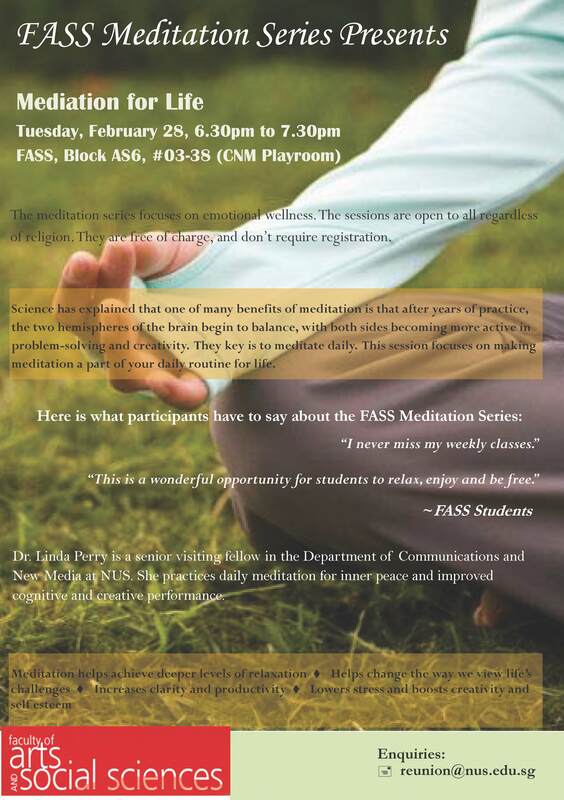 This work first begun as part of Mr. Loh’s honours-level research in the Department of Psychology at the National University of Singapore under Dr. Lim’s supervision. 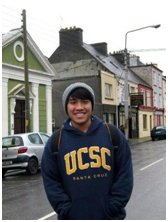 Following his graduation, Mr. Loh currently pursues a Masters degree in Cognitive Neuroscience at University College of London. Conference Program Chair Dr. Miles Whittington described Dr. Lim’s work as “having extremely important implications for the scientific community”. This is not the first time that Dr. Lim and his research team had gained international recognition for their outstanding achievements. 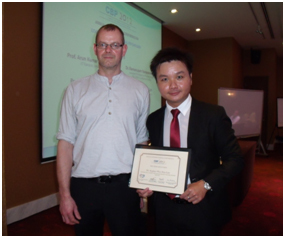 Last year, Dr. Lim and his students won the coveted Best Student Paper Award at EuroCogSci2011. Moving forward, Dr. Lim intends to continue training student researchers, some of whom he hopes will become stake-holders of scientific research in the long run.